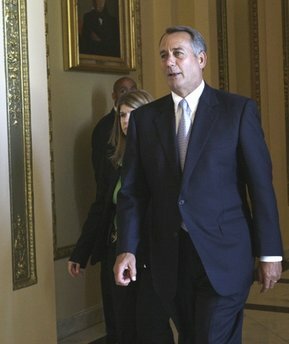 "House scolds Obama on Libya; dozens of Dems join"
WASHINGTON – The House harshly scolded President Barack Obama on Friday for launching U.S. military forces against Libya without congressional approval, fiercely disputing constitutional powers and flashing bipartisan frustration over a nearly three-month-old conflict with no end in sight. Over White House objections, the House did adopt a resolution chastising Obama for failing to provide a “compelling rationale” for the Libyan mission and demanding answers in the next 14 days on the operation’s objective, its costs and its impact on the nation’s two other wars in Iraq and Afghanistan. The resolution, though non-binding, says U.S. ground forces must not be used in the conflict except to rescue an American service member. The resolution will not affect current military operations to aid the rebels who are battling Moammar Gadhafi’s forces. NATO commands the operation, but the United States still plays a significant support role that includes aerial refueling of warplanes and intelligence, surveillance and reconnaissance work. The hours of debate reflected the anger among House members over Obama’s treatment of Congress, over tea party concerns about constitutional authority and expensive military operations in tough fiscal times and the nation’s growing weariness over war — in Iraq, Afghanistan and Libya. Freshman Rep. Tim Scott, R-S.C., revived candidate Obama’s words from December 2007 when he said the president does not have the constitutional power to unilaterally authorize a military attack unless there is an imminent threat to the nation. “The current president got it right in 2007,” Scott said. “It is the view of this administration that we’ve acted in accordance with the war powers act because of these regular consultations,” Earnest said aboard Air Force One en route to Toledo, Ohio. “What did he do, send a tweet to the chairman of the Armed Services and Intelligence committees?” Gingrey asked mockingly during the debate. In Libya on Friday, rebels contended they had forced Gadhafi’s troops from three western towns and had broken the siege on another as NATO jets bombed 10 targets across the country. The military action, in addition to the first publicized diplomatic contact between China and the rebel leaders, appeared to reflect continued erosion of Gadhafi’s power since the uprisings challenging his 42-year rule began in February. Boehner assailed the administration for failing to answer several questions about the operation, and lawmakers made clear that if the president doesn’t cooperate they have control of taxpayer dollars for the military. “It’s a non-binding resolution that takes pot shots at the president,” said Rep. Howard Berman of California, the ranking Democrat on the Foreign Affairs Committee. The House stopped short of abandoning the mission against the widely reviled Gadhafi and angering NATO allies who have come to America’s aid in Afghanistan. « What Really Happened in Bosnia?